”Guardium” UGV – FOP Shvachko V. V.
The Guardium UGV was entered to service for the Israel Defense Forces at the beginning of 2009. This robot is used for patrolling, escorting convoys, reconnaissance and protection, etc. The Guardium UGV can guard areas and attack any trespassers using lethal or less-lethal weaponry. 1. Home – G-Nius. – Mode of access: http://g-nius.co.il/index.php. 2. GUARDIUM MK I – G-Nius. – Mode of access: http://g-nius.co.il/unmanned-ground-systems/guardium-ugv.html. 3. Brochure GUARDIUM MK I. – Mode of access: http://g-nius.co.il/pdf/brochures/GuardiumUGV.pdf. 4. GUARDIUM-MK II – G-Nius. – Mode of access: http://g-nius.co.il/unmanned-ground-systems/guardium-2.html. 5. Brochure GUARDIUM-MK II. – Mode of access: http://g-nius.co.il/pdf/brochures/GuardiumLS.pdf. 6. Guardium MK III – G-Nius. – Mode of access: http://g-nius.co.il/unmanned-ground-systems/guardium-mk-iii.html. 7. Brochure Guardium MK III. – Mode of access: http://g-nius.co.il/pdf/brochures/Guardium-03-03.pdf. 8. Guardium. – Mode of access: http://ru.wikipedia.org/wiki/Guardium. 9. Guardium. – Mode of access: http://en.wikipedia.org/wiki/Guardium. 10. Flickr – Israel Defense Forces – Israeli Made Guardium UGV (1).jpg. – Mode of access: http://he.wikipedia.org/wiki/%D7%A7%D7%95%D7%91%D7%A5:Flickr_-_Israel_Defense_Forces_-_Israeli_Made_Guardium_UGV_(1).jpg. 11. File:Guardium001.jpg. – Mode of access: http://en.wikipedia.org/wiki/File:Guardium001.jpg. 12. 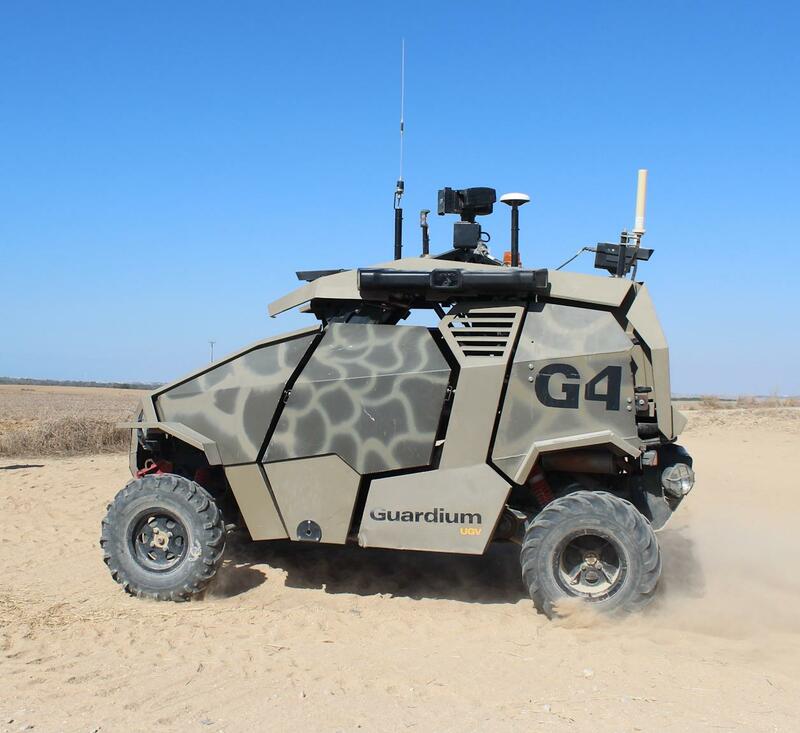 Guardium Autonomous Unmanned Ground Vehicle (UGV). – Mode of access: http://www.youtube.com/watch?v=BpUeiuo1GH8. 13. Guardium UGV G-Nius unmanned ground vehicle in action Israeli Army Israel. – Mode of access: http://www.youtube.com/watch?v=fdDzUP2heC0. 14. Guardium UGV. – Mode of access: http://www.youtube.com/watch?v=T55Drwr8Ux0. 15. Guardium. – Mode of access: http://www.youtube.com/watch?v=XP6E53sxs3A. 16. Guardium Autonomous Unmanned Ground Vehicle (UGV). – Mode of access: http://www.defense-update.com/products/g/guardium.htm. 17. Armored Tomcar. – Mode of access: http://www.defense-update.com/products/t/tomcar-armored.htm. 18. Israel Aerospace Industries Ltd. (IAI) Military Lahav Products UGV Guardium. – Mode of access: http://www.iai.co.il/17483-31663-en/Business_Areas_Military_Land_UGV.aspx. 19. Israel Aerospace Industries. – Mode of access: http://en.wikipedia.org/wiki/Israel_Aerospace_Industries. 20. IAI. – Mode of access: http://uk.wikipedia.org/wiki/IAI. 21. IAI. – Mode of access: http://ru.wikipedia.org/wiki/%D0%A2%D0%B0%D0%B0%D1%81%D0%B8%D1%8F_%D0%90%D0%B2%D0%B8%D1%80%D0%B8%D1%82. 22. Elbit. – Mode of access: http://www.elbitsystems.com/elbitmain/. 23. Elbit Systems. – Mode of access: http://en.wikipedia.org/wiki/Elbit_Systems. 24. Elbit Systems. – Mode of access: http://ru.wikipedia.org/wiki/%D0%AD%D0%BB%D1%8C%D0%B1%D0%B8%D1%82_%D0%9C%D0%B0%D0%B0%D1%80%D0%B0%D1%85%D0%BE%D1%82. 25. Israel Defense Forces. – Mode of access: http://en.wikipedia.org/wiki/Israel_Defense_Forces. 26. Армія оборони Ізраїлю. – Mode of access: http://uk.wikipedia.org/wiki/%D0%90%D1%80%D0%BC%D1%96%D1%8F_%D0%BE%D0%B1%D0%BE%D1%80%D0%BE%D0%BD%D0%B8_%D0%86%D0%B7%D1%80%D0%B0%D1%97%D0%BB%D1%8E. 27. Армия обороны Израиля. – Mode of access: http://ru.wikipedia.org/wiki/%D0%90%D1%80%D0%BC%D0%B8%D1%8F_%D0%BE%D0%B1%D0%BE%D1%80%D0%BE%D0%BD%D1%8B_%D0%98%D0%B7%D1%80%D0%B0%D0%B8%D0%BB%D1%8F. 28. Unmanned ground vehicle. – Mode of access: http://en.wikipedia.org/wiki/Unmanned_ground_vehicle. 29. Боевой робот. – Mode of access: http://ru.wikipedia.org/wiki/%D0%91%D0%BE%D0%B5%D0%B2%D0%BE%D0%B9_%D1%80%D0%BE%D0%B1%D0%BE%D1%82. 30. Dune buggy. – Mode of access: http://en.wikipedia.org/wiki/Dune_buggy. 31. Баггі. – Mode of access: http://uk.wikipedia.org/wiki/%D0%91%D0%B0%D0%B3%D0%B3%D1%96. 32. Багги. – Mode of access: http://ru.wikipedia.org/wiki/%D0%91%D0%B0%D0%B3%D0%B3%D0%B8. 1 Author published this work under the Creative Commons Attribution-Share Alike 3.0 Unported license.